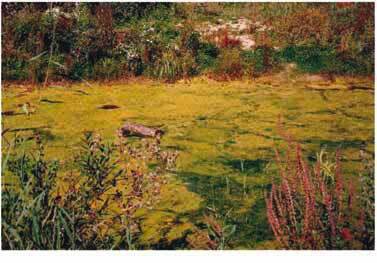 Spirogyra is a green algae often referred to as water silk - the less appealing name is "pond scum". Spirogyra is found in fresh water and each cell has two layers - the outer wall is composed of pectin that actually dissolves in water and makes it slimy. The inner wall is composed of cellulose. 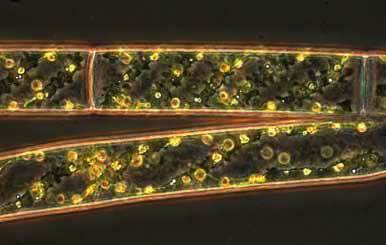 Chloroplasts are embedded in the cytoplasm and can be seen in the spiral, ribbon-shaped pattern in the image below. Spirogyra captured at 800x under the microscope. Spirogyra is a popular green algae to view under a biological microscope due to its ease of sample gathering and its interesting and beautiful spiral patterns.